Everything seems reasonably normal when House of Sand by Michael J. Sanford opens, well, if a wife berating her husband mercilessly for his lack of get up and go is normal? And if his loving 8-year-old daughter, Aza, with her filthy mouth and some kind of sixth sense into what her daddy is feeling, seeing and doing is normal. Then there’s the man’s good-looking, bisexual golfing partner, Ty, who seems to really care about what the man is going through and would love to help him. Yet, between the three of them, and even though he’s trying, the man can’t seem to pull himself and his life together. When he discovers his wife is having an affair, he goes over the top, rips his life apart, and the result is fire, violence, bedlam and bloodshed. The only thing that stays the same is the incessant ticking and tapping he hears as he, and the readers with him, try to sort through exactly what, how and why it all happened, and ultimately who was responsible? A schizophrenic? A mentally disturbed man with multiple personality disorder? An evil murderer? Just what is it with this mild-mannered husband and father? Is he just so overwhelmed by career and marriage stresses that he loses it and sets his home on fire with his wife inside it? 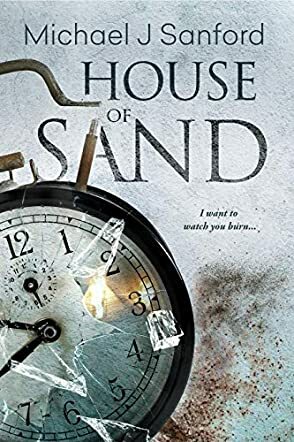 Those are some of the questions readers of this psychological thriller, House of Sand by Michael J. Sanford, will be asking themselves as the protagonist’s agitation, confusion and anxiety mount with every tick, tick, tick of a clock only he can hear. Fans of psychological thrillers will love House of Sand. The plot line moves quickly and tension mounts throughout, along with the many unanswered questions that will keep readers guessing. Some may find the last section a little too drawn out, but let’s face it: a descent into madness generally takes a bit of time. Enjoy the ride!